HomeProductFrozen BeverageAlligator IceAlligator Ice Lids 12 & 20 oz. Alligator Ice Lids 12 & 20 oz. These white lids are for use with Alligator Ice cups for 10 to 20 oz. These lids will make a great addition to our clear logo cups. These lids will help prevent spills and are recommended for commercial sales. Alligator Ice Cups 12 oz. Alligator Ice Cups 20 oz. Dart Plastic cups 24 oz. Dart Plastic Cups 16 oz. Dart Plastic Lids 12 oz. Dart Plastic Dome Lid 24 oz. 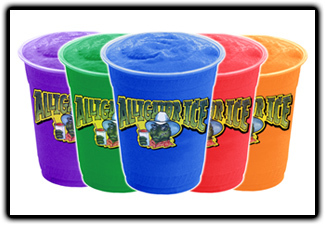 Alligator Ice is an industry leader in producing top quality frozen drink mix along with great tasting beverage mixes.Whether you are a convenience store in the need of a frozen drink program, a school that needs a slush drink that meets USDA requirements or maybe a bowling center that needs new slush drink equipment and mix, Alligator Ice is the best choice for you.Alligator Ice slush syrup comes in fun colors and great flavors that will be a definite frozen drink favorite. You will find that Alligator Ice has top notch frozen drink concentrate and industry leading beverage programs.